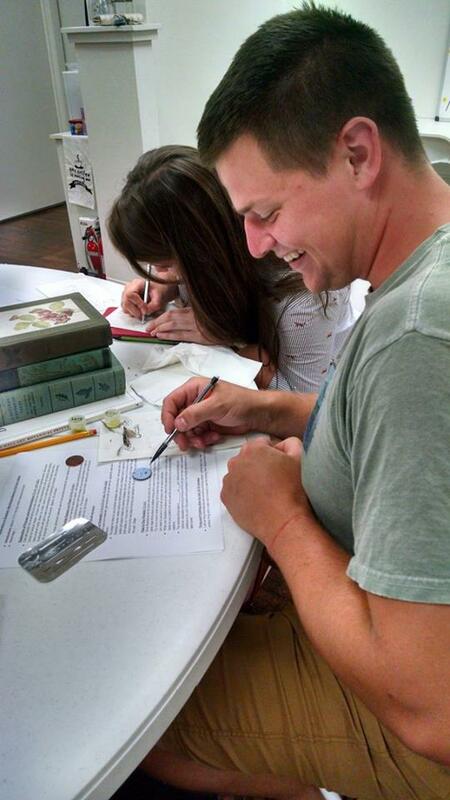 CLASS GIFT CERTIFICATES: Give the gift of creativity and fun, where they can create their own pendant! Register for a class below, and in a note at checkout please specify that it is a gift, and I will send you a (personalized optional) certificate for the class, along with a class description and itinerary. 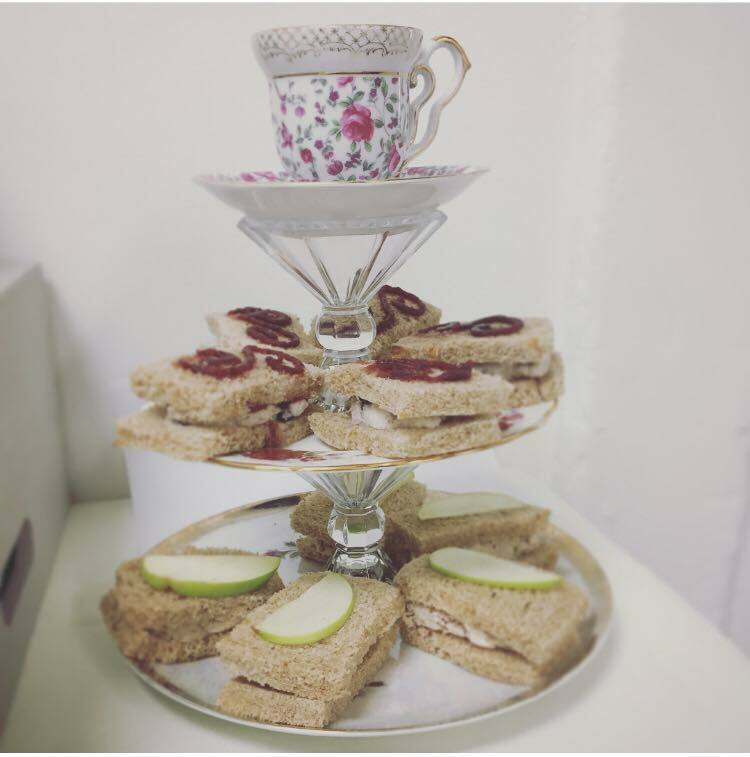 PRIVATE PARTIES: If you have a group of 4 or more, a private workshop can be scheduled, email for more information. Themed events like birthday parties, etc, can be hosted and are very fun! Contact the artist for questions. 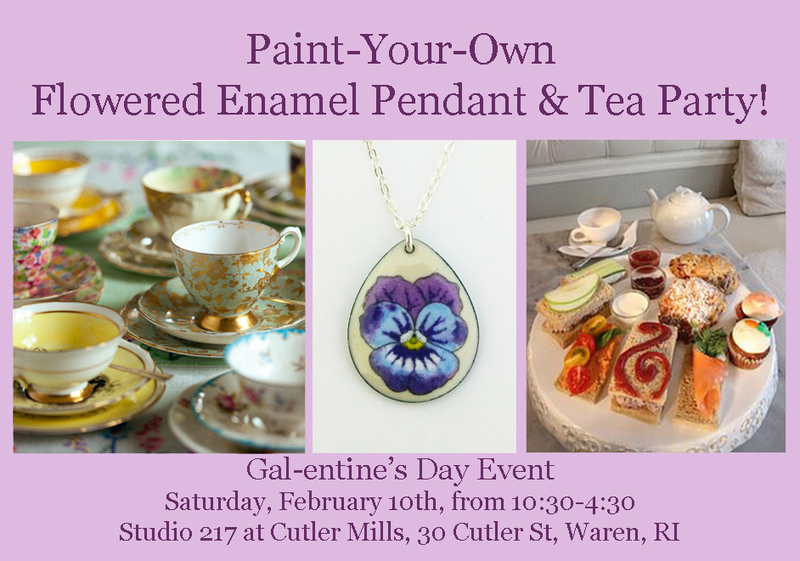 One-Day Workshop: Paint-Your-Own Flowered Enamel Pendant & Tea Party! 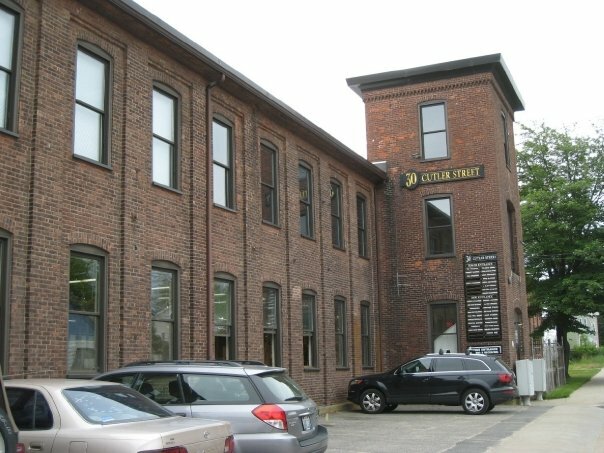 Location: Studio 217 at Cutler Mills, 30 Cutler St, Warren, RI. 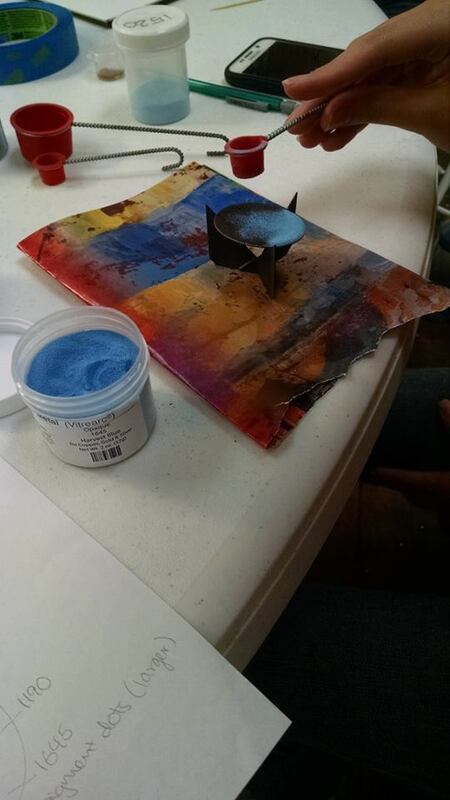 Give the gift of creativity & fun! Class Gift Certificates available. 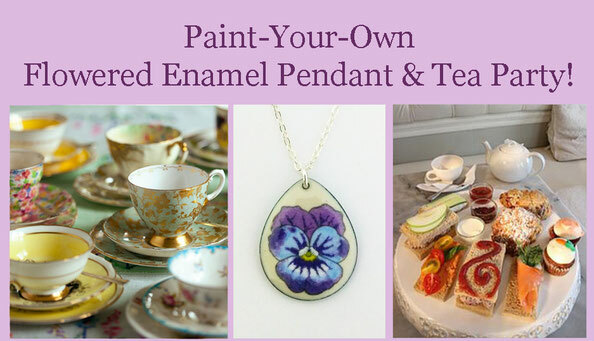 to create a beautiful heirloom quality hand-painted enamel jewelry piece, and enjoy Tea Time! Perfect for Mother's Day, private Bridal parties, showers or Birthdays, or to enjoy with your girlfriends, sisters, mothers-daughters or bridesmaids! 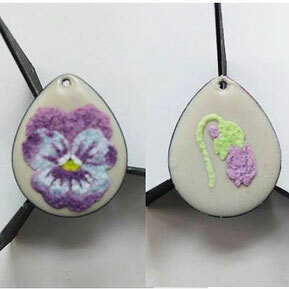 You will create a lovely pendant with a flower design of your choosing, with as much assistance as you would like from instructor Cait Marchetti. This class will have a few flower designs to choose from with simple instructions on how to create, or you can create your own flowered design! 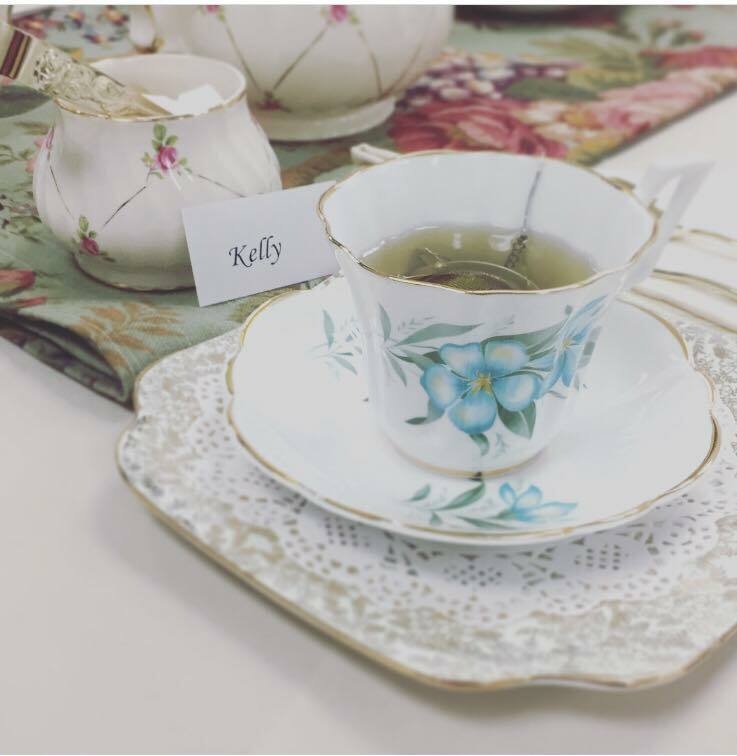 Afternoon Tea will be served at approximately 1:00 during the event. 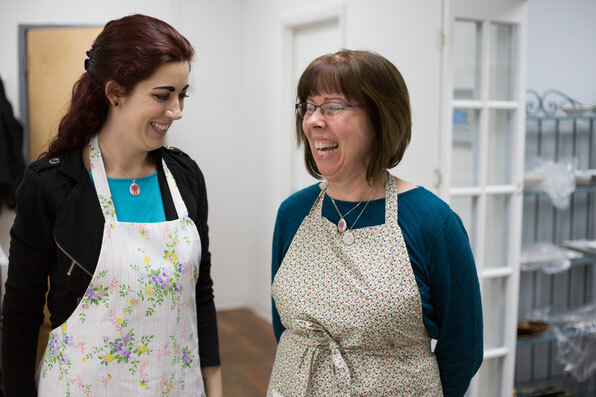 Your choice of dressing up a little, or comfy casual-- as cute flowered aprons will be provided! OR- BOOK YOUR OWN PRIVATE PARTY! You may also inquire if anyone is currently signed up for a date, and if not, request it be set aside for a private party. This Event is held as a single-day event (on an option of the dates listed), from 11:00 - 3:30 pm (4.5 hrs- including an hour of Tea Time/ Lunch break). 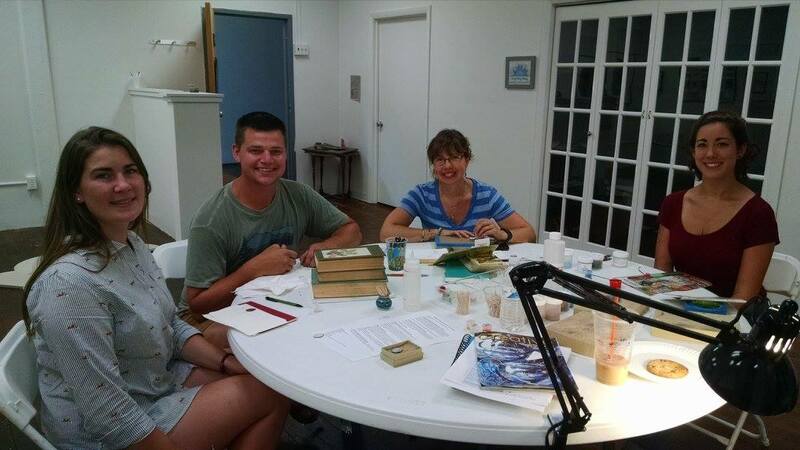 Held in the decorated classroom space at the artists' studio, Studio 217 at Cutler Mills, 30 Cutler St., Warren RI. 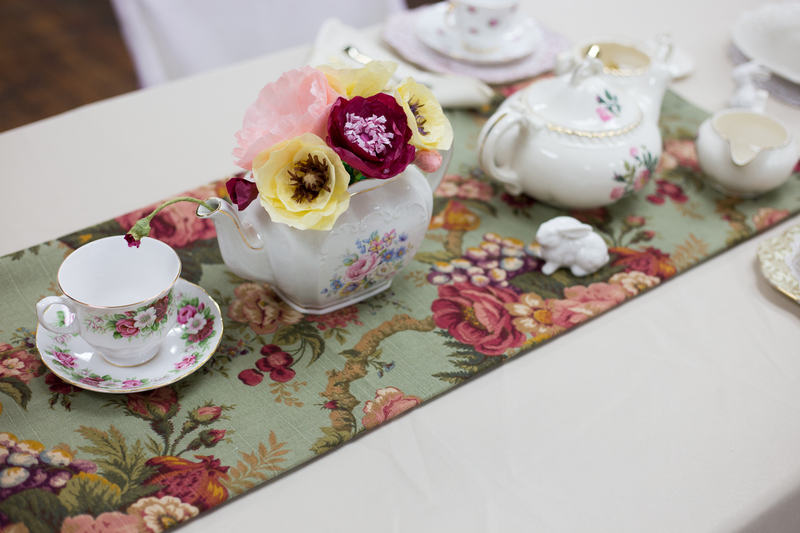 Cost: $120 (includes all materials, tuition and afternoon tea/lunch. Scroll down page for detailed workshop itinerary. 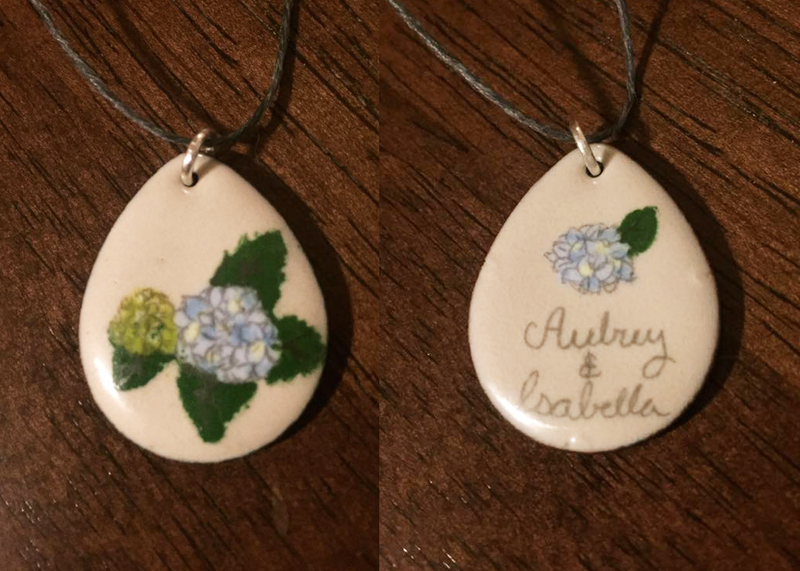 This event is a fun social art class & event for any skill level, where you hand-paint a flower design on a pendant (or other jewelry piece), to create a beautiful heirloom quality hand-painted enamel jewelry piece, and enjoy Tea Time! 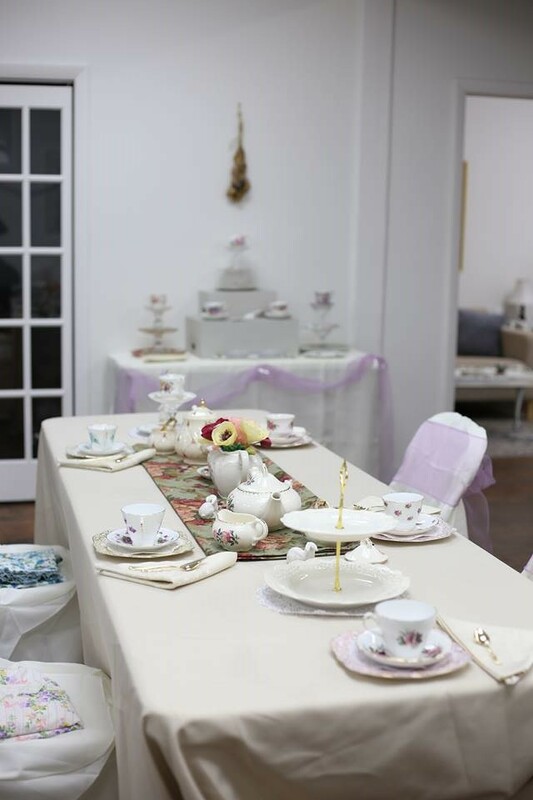 Perfect for Mother's Day, private Bridal parties, showers or Birthdays, or to enjoy with your girlfriends, sisters, mothers-daughters or bridesmaids! 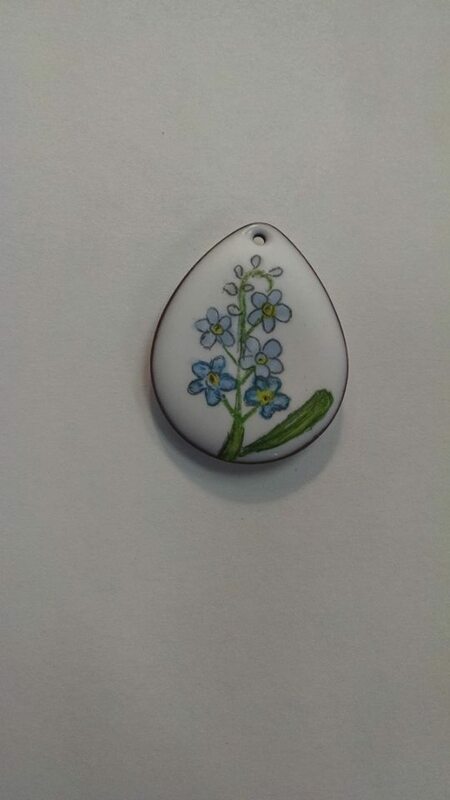 -All materials to create an heirloom quality enamel pendant (or a brooch)- Complete with a pre-enameled disk in the color and shape of your choice, ready for painting on. 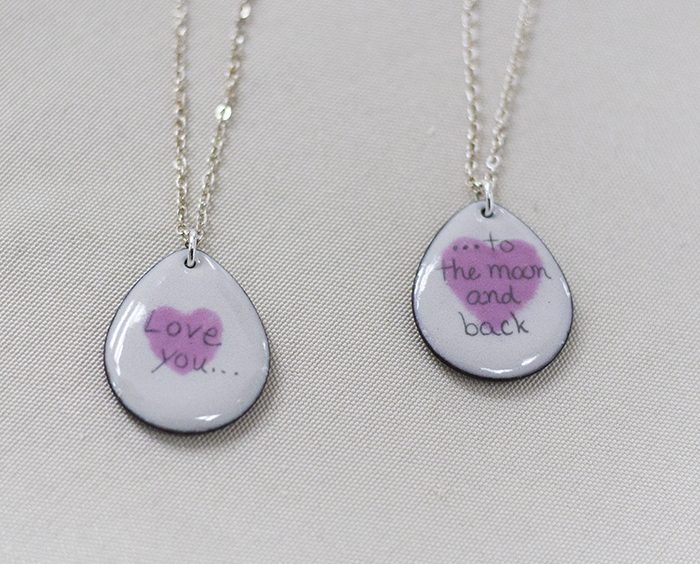 Comes with a sterling silver chain, packaged in gift wrap and with a complimentary CMJ design greeting card. 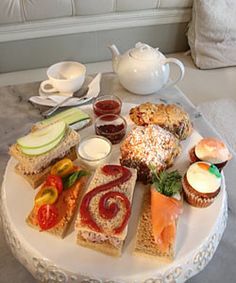 -Tea, Tea Sandwiches, Scones & Jam, Mini cupcakes & cookies, catered by The Duck & Bunny (Providence RI). 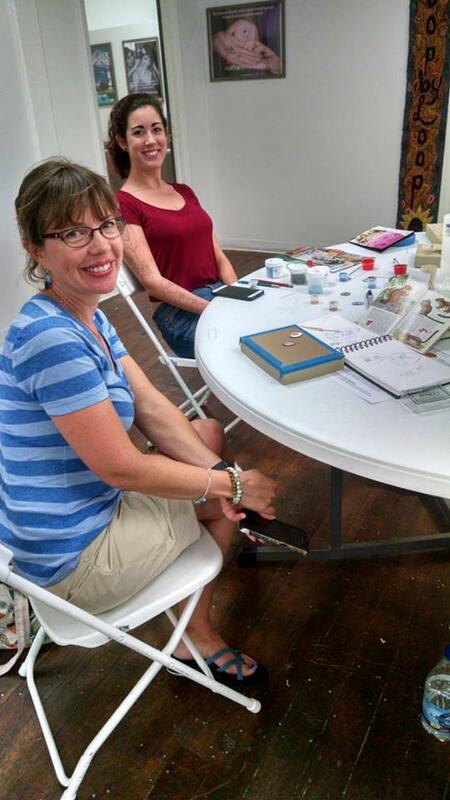 Artistic Ability/ Design Details: This class tuition price includes all materials needed. 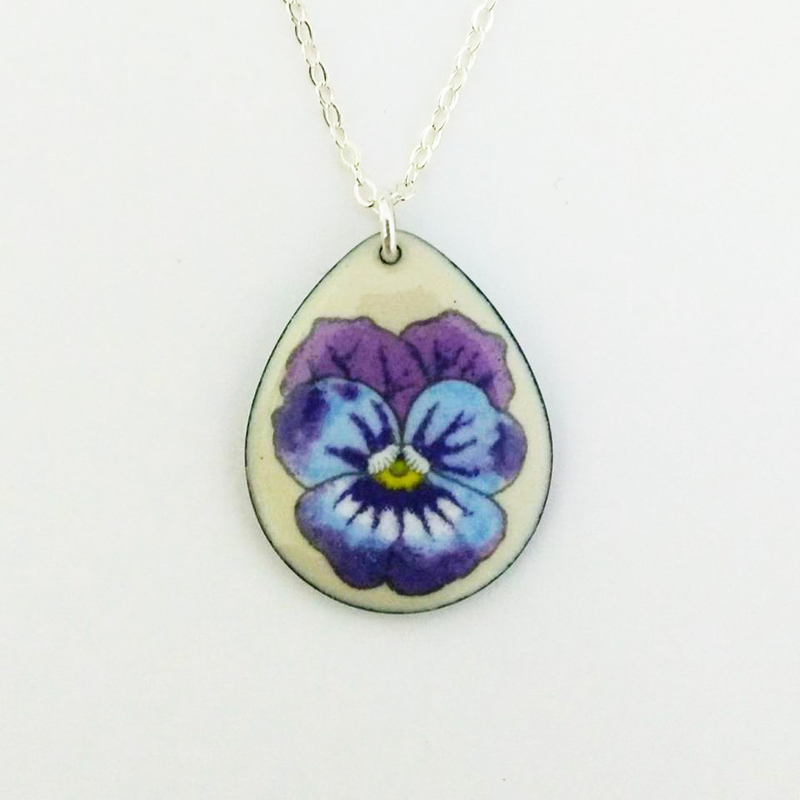 You will choose an existing flower design or design your own flower for front (and back side optional) sides of a pendant or brooch. There will be many simple designs you can choose from. 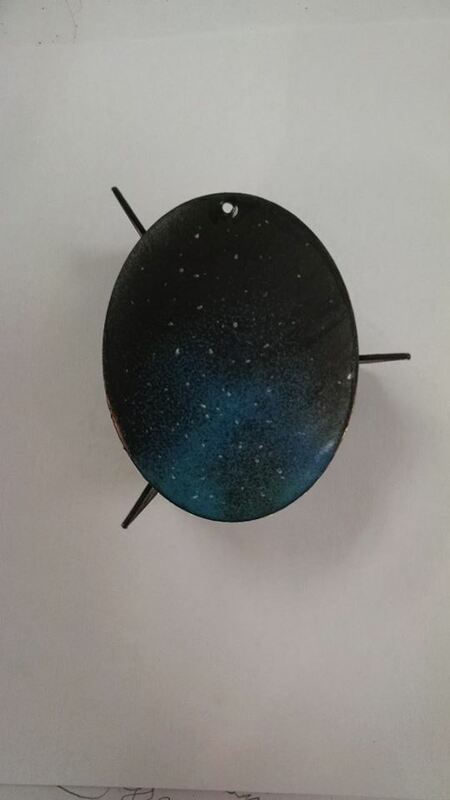 With Cait's assistance you will choose what enamel colors to paint your design with, then you will practice on a test enamel with the class, then we will hand-paint on the prepared enamels. 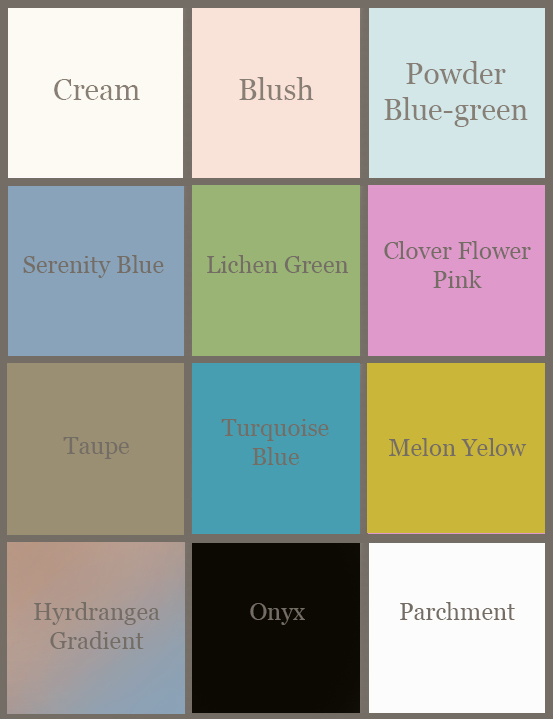 The medium is very forgiving and wipes off clean if you make a mistake, no worries, it is very easy to fix. Firing the enamel is like saving your work, it bakes the colors into the glass. 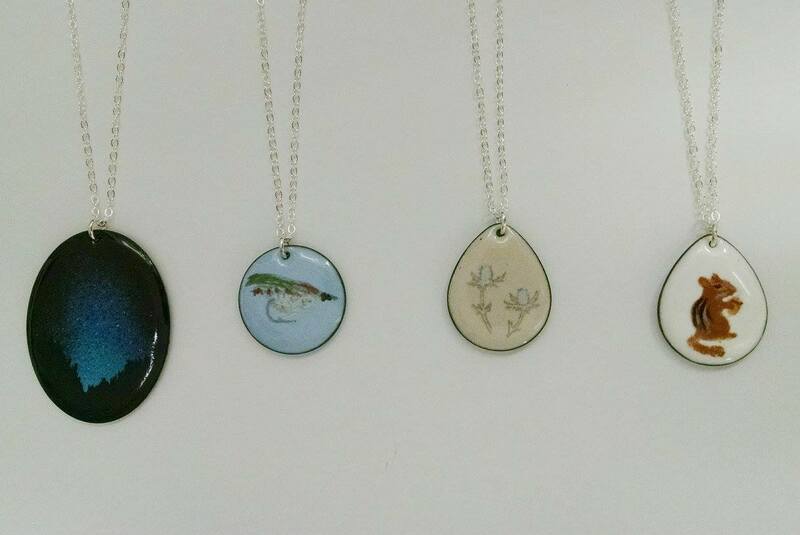 Once you are happy with the design, Instructor Cait will do a firing demo- you will be able to see your work firing, which is really fun! 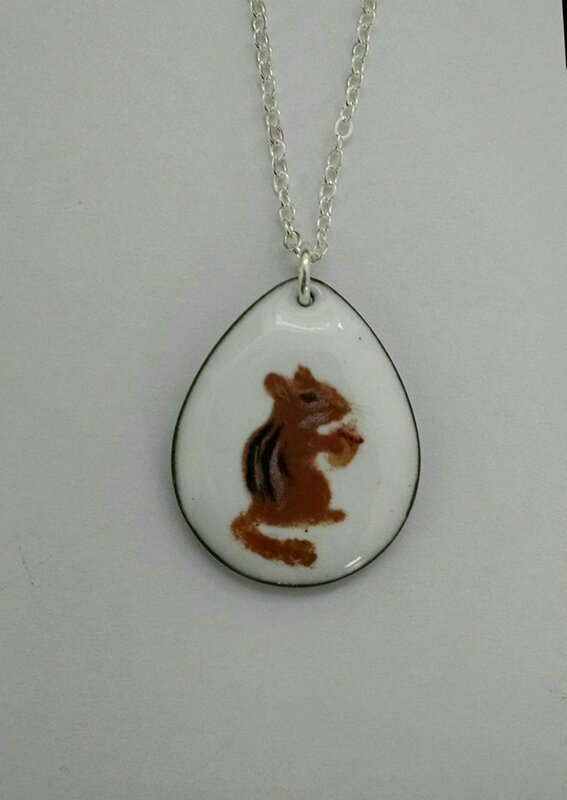 When its fired, you can add more layers of color and detail, and when it is finished and ready for firing by the artist, and will go on a sterling silver chain. Other Information: This class runs based on interest, and you will be refunded in the rare case that it doesn't run, or can have the option of a make-up date. The class size is minimum of 3 and a maximum of 8 participants. Please include your contact information (including phone number) at checkout. 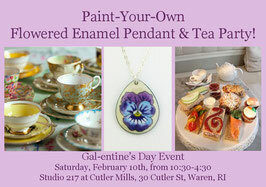 This class will take place at Cait's studio in Warren, RI. You must be able to climb stairs, and there is free parking close by. Safety: By registering for this class you are agreeing to adhere to the safety rules to listen to the instructor when in the kiln room and understand that you are responsible for your own safety in this workshop. You must not touch the kiln at any time including during the demonstration, and listen to safety protocol. 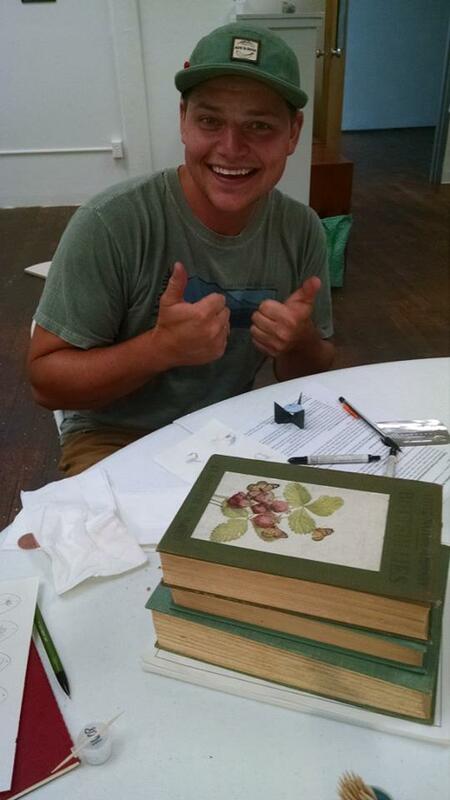 This is a painting /drawing class, and you will not be operating the kiln. That portion of the class will be a short demonstration at the end, with your safety in mind. 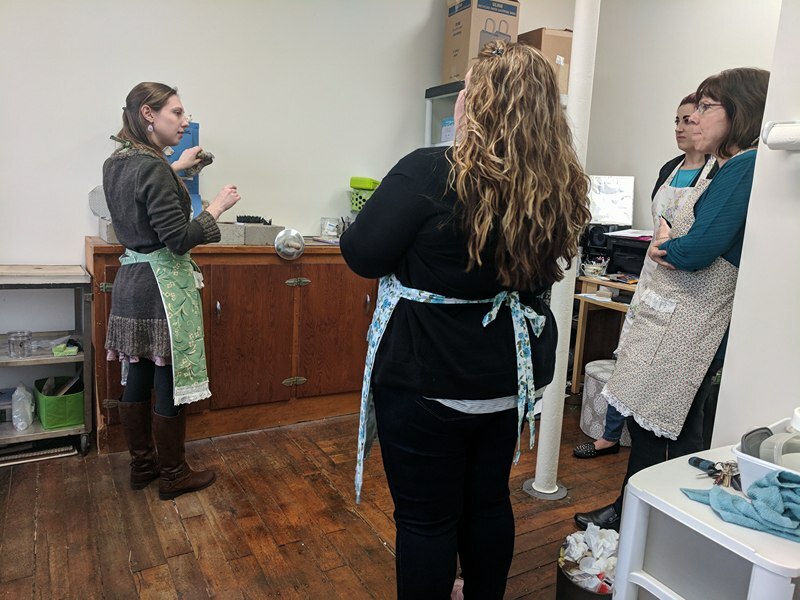 *Children under 12 are allowed to participate in the class on the condition that they must be accompanied by a parent or guardian at all times, and in some instances may not be allowed in the kiln room for the demonstration. * Safety first! 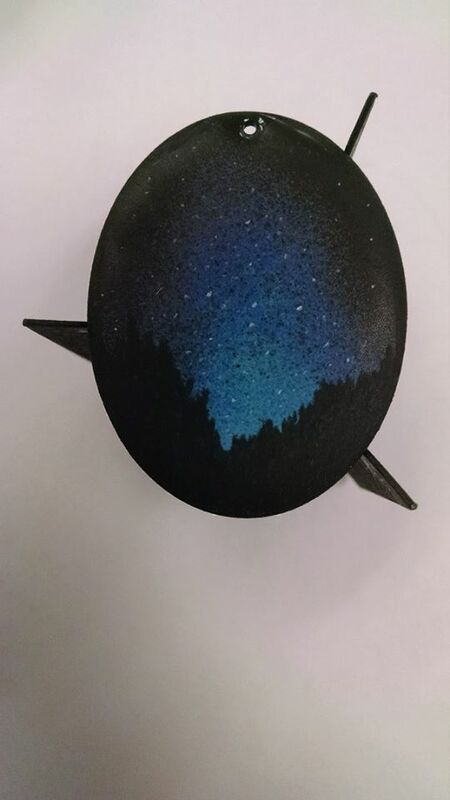 Contact: Make sure to email Cait to confirm the date your attending, and discuss if you do have a preference on what shape and color enamel base you would like to start with, and to get any directions to the class you may need. 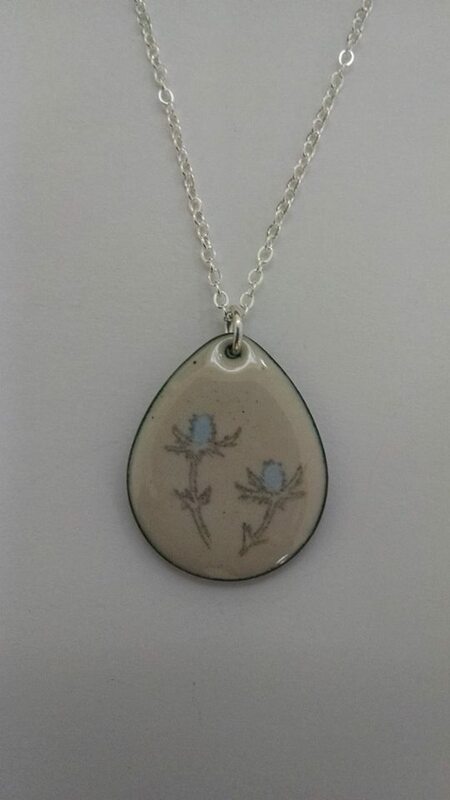 If you do not have a preference you will be provided a Large teardrop pendant with a Cream enamel background, as is most common and neutral. 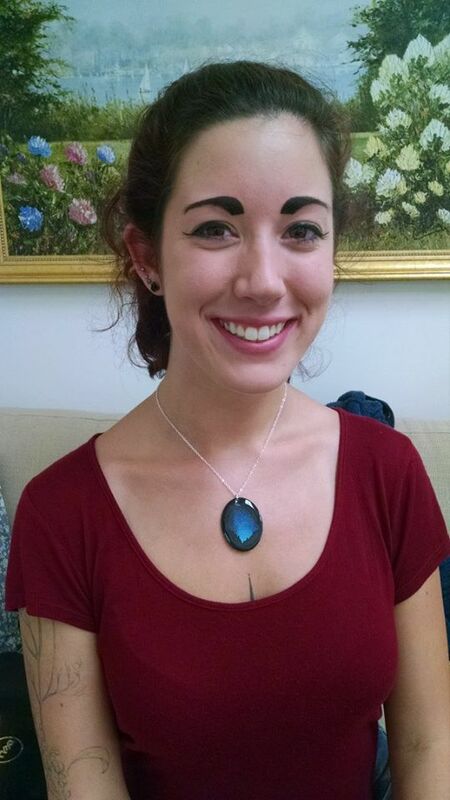 Cait will quickly explain the enameling process. The great thing about this class is that all the drawing and painting aspects can be wiped clean off if you make a mistake with any of the wet-packed enamel pigments or graphite. Firing it in the kiln is like saving your progress, and you can build more layers of color and drawings on top of that. In this way, it is a very forgiving medium-- before it is fired. I will be doing the firing during a demonstration, so you don't have to worry about that. 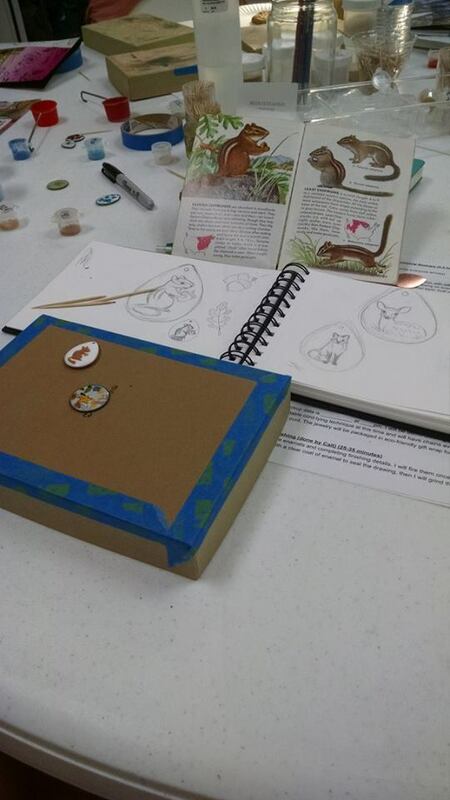 Then you will get to see a demonstration of drawing on enamel and see some in-progress pieces. Demo drawing with enamels wet-packing technique and have fired pieces (later steps) to show the process. Do tests on a test piece to learn! 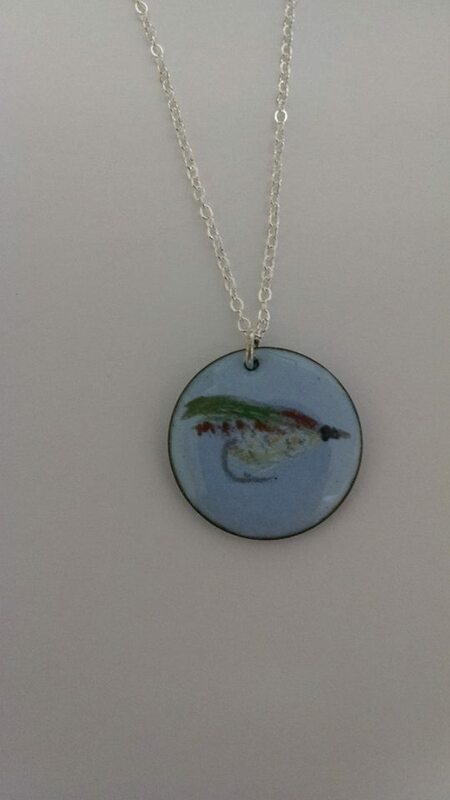 Paint designs onto the enamel using wet-packed enamels on one side and then the other. I will assist during this time whenever needed. I will supply all materials and help with any mistakes or need to "erase" or wipe away paint from the glass. 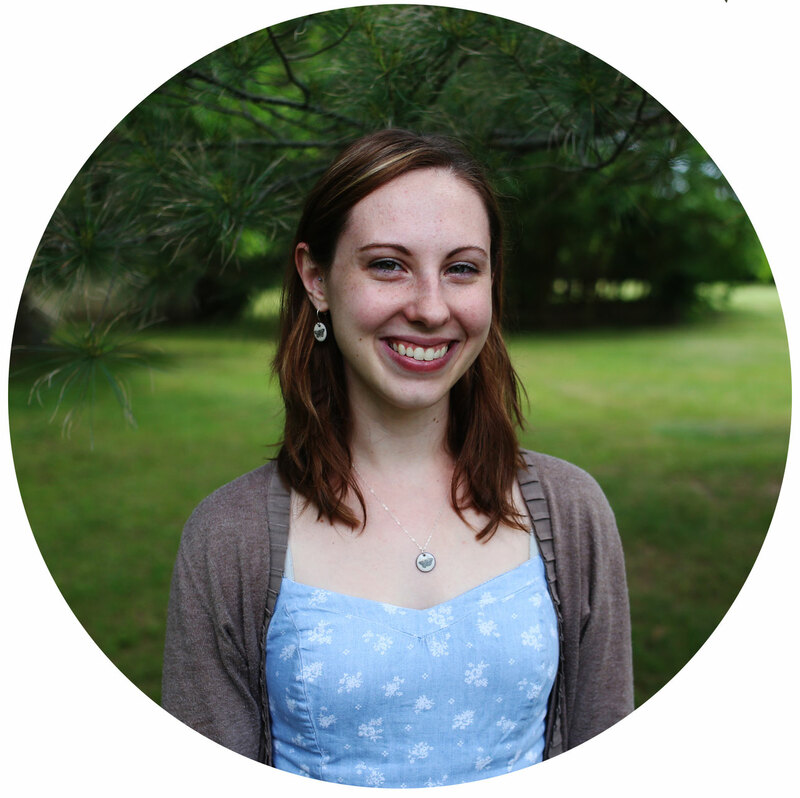 It's okay to make mistakes, and to practice first on the shared practice piece! You begin to draw the details and outlines on your enamel (simplest side or back first). I will assist with any illustration issues, erase any mistakes. No rush, you have at least one hour and 15 minutes to draw (total for both sides). If you finish early, that’s okay! You can move on to the next step of turning your pendant in, and work on another project provided. It’s up to you how long you spend on this part. If you finish early that is okay, there will be adult coloring pages and drawing exercises you can work on. Once illustrations on the back side are done, without moving the piece, keep it on the platform. Try not to move it while drawing, this is where the tape comes in handy! When your illustration is done on both sides of the enamel, bring it to me to turn in, still taped on your platform for me to carefully remove and fire in the kiln. I will fire one as a demonstration to the class, grind the burned edge and dip in a dark patina, then solder a sterling silver bail on and polish it. 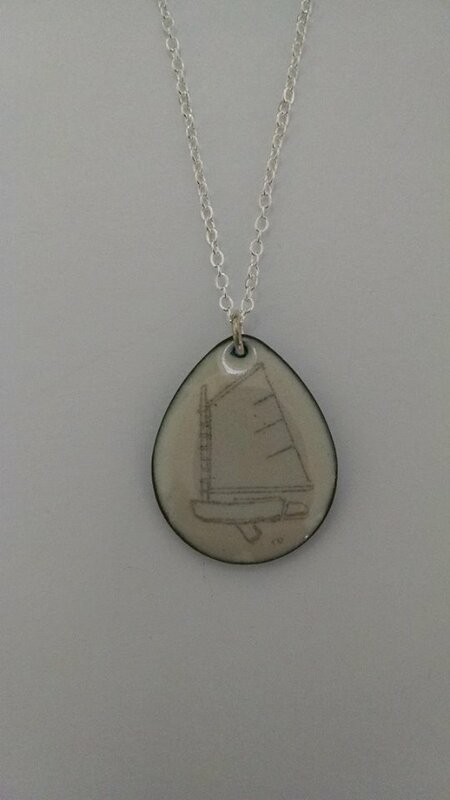 It will then be put on an adjustable sliding knot cotton cord in the color of your choice, or on a sterling silver chain. If you cannot come back at a later date to pick up your piece, get your piece shipped! 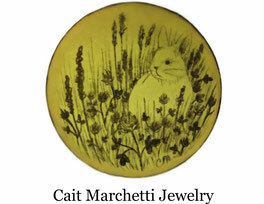 Optional shipping is a (subsidized by Cait/ reduced fee) of only $4.00. 1) A sketchbook (approx 8”x 11”) to be used for sketches and as a platform for drawing on. I will have some paper and a platform of sorts if you don’t have a sketchbook to bring. 2) Idea(s) and inspiration for drawing- flower designs will be provided, but if you think you want to create your own then maybe think of some ideas in advance. 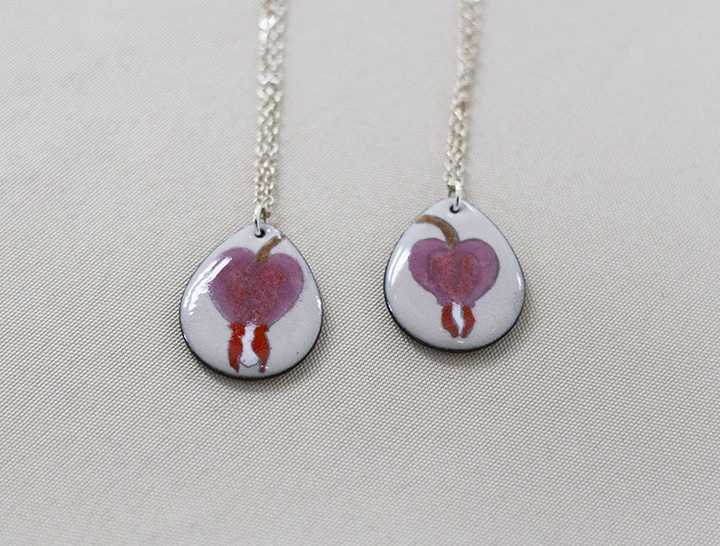 (Ideas such as example seed on one side flower on the other, or easier: writing a name, date or quote on the back) for both sides of the pendant. This could be an actual flower or motif on an outfit maybe you'll want to wear or bring to the class to copy. There will be time during the class to finalize your design, but please come with ideas if possible to speed the process. 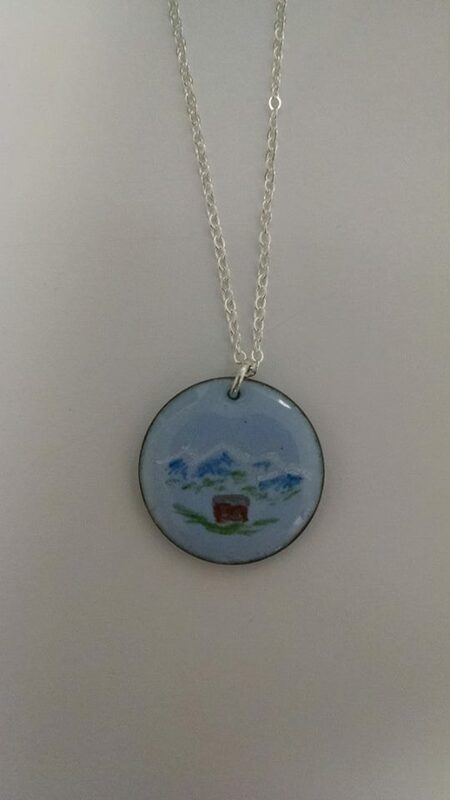 Please keep in mind the pendant size is about the size of a quarter, so keep it simple or able to fit within the space. All other materials will be supplied by the instructor!